бля она у меня даже не показана на карте на 375 горнека она на карте не изображается! Так что лучше идите профу качать сначало в шаттры там вы прокачаете до 400 а потом в норде вам будет легко! С уважением игрок сервера CLN рога 80 Nightkiller! На карте залежи руды отображаются вне зависимеости от скилла. Превед перадко! Цена стака в среднем составила 37 голд/стак (888 за 24 стака). Заключение: для развития ювелирки выгоднее, чем покупать камни, но как способ заработка не годится. Все коменты в основе своей правильные, но есть проблемма!Большенство игроков следуют им по этому(особо в выходные) в эти локи можно и не соваться. Я пошёл по обратному пути. Борейка-- вдоль берега(по кругу), итог 35мин 4стака(не полных)!На плюсы не надеюсь Но факт! В Зул'Драке куча ее,ищите и имейте терпение, удачи вам. Cobalt looks to be the new Fel Iron, minable at 350 mining skill from Cobalt Node, and taking 1 ore to smelt into a bar. Wowhead also has an entry for Rich Cobalt Node, whereas Fel Iron in The Burning Crusade did not have a rich eqivalent. I'm assuming that the suffix "Node" is just a placeholder for the beta, and will be replaced by "Vein" or "Deposit". Edit: It's a few months later, and the suffix "Node" still remains. The word doesn't seem to fit in with the game world well, but it's no big deal. As of 8/7/2008, this ore has only prospected into Outlands uncommon gems. Save it up till prospecting is implemetned. And now in the latest build, cobalt ore prospects properly into Northrend gems. Sweet. No more dust apparently, fwiw. Prospecting data here must either be wrong or Blizzard haven't finish it. According to my experience all colors of gems "spawn" with same rate. Between Cobalt and Saronite, your gear can irradiate you or drive you insane. Blizzard REALLY wants Blacksmiths to level their skill fast. Its just incomplete, after only 2000 records of prospecting you dont have enough data to make the estimate accurate. But its probably about 22% chance each (since you can get multiple gems from 1 prospect). is it just more or is the spawn rate of these less than everything else in classic and outland nodes? In borean tundra I have leveled and only seen like 5 nodes. In Classic and Outland Fel Iron and copper were every 2 feet. Cobalt (pronounced /ˈkoʊbɒlt/) is a hard, lustrous, grey metal, a chemical element with symbol Co. Although cobalt-based colors and pigments have been used since ancient times, and miners have long used the name kobold ore for some minerals, cobalt was only discovered in 1735 by Georg Brandt. It is found in various metallic-lustred ores for example cobaltite (CoAsS), but it is produced as a by-product of copper and nickel mining. The copper belt in the Democratic Republic of the Congo and Zambia yields most of the worldwide mined cobalt. Cobalt is used in the preparation of magnetic, wear-resistant, and high-strength alloys. Cobalt blue (cobalt(II) aluminate, CoAl2O4) gives a distinctive deep blue color to glass, ceramics, inks, paints, and varnishes. Heres my route I'm using without a flying mount, I'm sure it'll change somewhat then. Its simple and easy to remember after a couple laps. Gatherer makes the notes and they will list as you mine them. But you can download WoWHeads database here. You have to import it to gatherer ingame, instructions are there with the download. got a lvl61 DK who i made for mining purposes. Anyone know the best place to find a vein without lvl? mobs coming after him ? hes mininglvl 425 so any vein will do. Using the Wowhead plugin for Gatherer I followed a route in Howling Fjord. I hit every node going from Fort Wildevar, south, past the Explorer's Outpost, north of Utgarde, south east to New Agamand, and then followed the eastern coast to the mountains, and back to Fort Wildevar again. I am going to keep records of my cobalt received during a circuit. I will follow my route everyday, probably once a day. I tried to go to Zul'Drak for rich cobalt but it seems to yield less cobalt. May or may not be caused by other farmers. With the blacksmithing nerf I will stop gathering cobalt until I find another reason for them. This is the route im using atm. Gathering very nice in ZD. Its easier if u have a flying mount due to the environment in ZD. My somewhat limited experience in prospecting these and saronite ore tells me that cobalt ore is better to prospect than saronite. Why? Because i usually receive 2 uncommon quality gems per 5 prospected cobalt ore while this is more uncommon when prospecting saronite. The drop rate for rare quality gems does not seem to be very much better when prospecting saronite ore than cobalt ore.
A downside when farming cobalt is that you won't find any titanium ore. 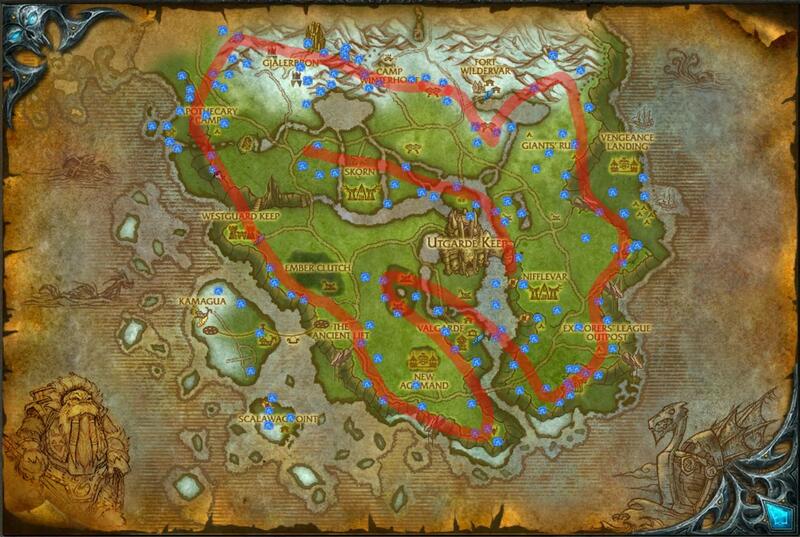 Awesome Route man, Only thing I would add is to circle that Blue crater just below the Alter of MaM'Toth. Other then that, this route has worked perfectly for me. Thanks a Ton! Got 10 nodes in 1 loop (15 mins) using Must's route and Shadow's idea to go to Mam'Toth. Thanks alot! Cobalt can NOT be mined just by being level 350 mining. I was rather annoyed, because it didnt happen when i did the same thing in OL, I could mine adamantite when i was level 40. Im not sure what level you do have to be to mine it, probably 60, hopefully not 68 but Ill let you know when I get there. Edit: Cobalt can be mined at 65. I just went back today and could get it and read some other guys post on thottbot that said level 63s couldnt mine it so I guess 65 is the lowest level you have to be. Excellent route, thanks. After trying both Borean Tundra and Howling Fjord, I found Zul'Drak to be far superior. This is most likely due to the smaller size of the zone and thus having a higher density of the ore. I was getting about 4 stacks every 30mins here, but only about half that amount in Borean Tundra and Howling Fjord. Maybe I wasn't lucky enough but I think that flying over Borean tundra is better. Flying over the tundra is awful, i spent about 30 minutes on the route from wow-professions, I mined only 9 ores. My mount is only 150% speed though, but still, very rare. Going to try out the howling fjord guide someone posted. Heard that Zul'Drak is great but its not really a good place for routes, just random it seems. thank you so much for this guide, its amazing, WAY better than the wow-profession one. I was shocked at the stacks I had after I did one route, was able to make 101 cobalt bars. Way better than any other guide or advice I seen. For Borean Tundra, there also seem to be a few of these along the cliffs near Valiance Keep. Not many but I found one or two there. They're very scattered through the Coldarra area too. Guess this part of Northrend is just not the best for them ;). Thanks for the links showing a good route though. I have read here that since Cata was released that Cobalt Ore was becoming harder to find, I was lvling Engineering and Blacksmithing so I was not happy to hear this. I used this addon to help me - GatherMate2 & the GatherMate2 database both downloaded from Curse. I used this instead of Gatherer because gatherer doesn't by default come with a database and the one they do supply is way way out of date. So to sum up, I don't think it's that bad really, it's not thorium ore in Ungoro but it's not bad. I hope this helped ppl farming , if you got some hope from this please mark it up so others can see it. As of October 27th has cobalt in Howling Fjords been nerfed? I did 3 complete sweeps and have only 37. The nodes just aren't there! just did one circuit at 8am and got 34 ore. with a return like that i didn't have the patience to fly it two more times. gonna try borean, but reading the comments i'm not all that hopeful. Best place I've found for it is Zul'drak, This is at 11pm English time, Finding quite allot compared to my trips around Howling now. 4.3 has just gone live and the previous post is still true. All this data was collected around midnight GMT, with a 280% mount and the bountiful bags perk. Which took under 25mins. This is around double what I found in Zul'Drak in a similar timeframe. Previously, I had been running zul'drak and I found most of the nodes, even at off-peak times were inactive, giving roughly a 10% hit rate (of the known gathermate nodes). Howling Fjords on a full loop of the area was yielding a 30% hit rate, which more than makes up for the overall scarcity of nodes compared to other areas. As an added bonus, respawn rate is mind-boggling, it is also very rare to find other miners competing. Most of the mines/caves are small enough to sprint through, grab the node and be back within a minute. Baelgun's dig (SE corner) has some hard to reach nodes that are worth ignoring. Zul'Drak IS NOT a good place to farm these as a few would have you believe, after an hour of flying around in my lvl 82 warrior I found ONLY 5 NODES! and they do not respawn quickly as previously stated... you will have much better luck in Howling Fjord. Be very careful what you sell your stacks of Кобальтовая руда for prior to MoP's launch (which is now slated for Sept.25, 2012)!. In other words, for the next 2 months, unless you are getting an exuberant amount for your stacks, don't sell them. In order to proficiently level blacksmithing you need roughly x320 cobalt ore. That's 16 stacks for ONE leveling blacksmith. This ore is one of the more "irritating" ores to farm in that it is somewhat scarce in its respective zone(s) and is native to Northrend: an area players will quickly want to level and leave behind in their pursuit to level 90 and Pandaren zones. This isn't even taking into account JCs who will need to prospect ore for gems or Engineers who will need a ton of this ore to level, as well (approx. x275). Granted, JCs will probably skip right over cobalt ore due to the markup it will get (because of what I mentioned above) but there may come a time when there is no saronite ore on the auction house and just your stacks of cobalt ore for 150g (results will vary due to server economy variation). Time: 2 hours Started at 1:30 PM on Sunday. Just made one entire pass of Howling Fjord, about 15 minutes total, at 280% flight speed. No competition that I was aware of. Sunday morning, 3:15AM EST. Mined 44 Cobalt Ore total, and a bunch of crystallized earth & water. -Mined from Залежи кобальта which is found in Zul'Drak (207), Howling Fjord (167), Borean Tundra (155), Dragonblight (134), Grizzly Hills (110), Utgarde Keep (16), The Storm Peaks (11), and Crystalsong Forest (8). -Mined from Богатые залежи кобальта which is found in Zul'Drak (167), Howling Fjord (147), Borean Tundra (133), Dragonblight (114), Grizzly Hills (89), The Storm Peaks (4), Utgarde Keep (3), and Crystalsong Forest (2). -Contained in Усиленный ящик (33%) which is fished from Howling Fjord (75; 4%), Borean Tundra (53; 3%), Sholazar Basin (35; 3%), Crystalsong Forest (26; 4%), Dragonblight (12; 3%), and Grizzly Hills (8; 4%). Усиленный ящик can also be fished from a few other locations at very low percentages. -Can be prospected for Огромный цитрин (24%), Сумрачный кристалл (24%), Кровавый камень (23%), Кальцедоний (23%), Темный нефрит (23%), Солнечный хрусталь (23%), Императорский топаз (1.4%), Лесной изумруд (1.3%), Небесный сапфир (1.3%), Сияние осени (1.2%), Алый рубин (1.2%), and Сумеречный опал (1.2%). Кобальтовая руда is one of the highest priced ores on the Auction House. So, it is very good to sell for a profit. The current (12/20/14) market price for all US realms is 5g 81s per ore or 116g 20s per stack. If you are looking for the fastest possible way to obtain Cobalt in WoD, head for Zul'Drak. Rich Cobalt Veins still give cobalt ore nuggets, but do so in a significant enough amount to get at least 3-4 ores after combining. I've been mining in this location over the course of several days on various time brackets, and I have yet to encounter a competing miner. Whereas in Borean Tundra or Howling Fjord you can count on competitors. Hope this helps, it sure sped up things for me. this is indeed very sad, you can fly around Zul, with no competition at all , and get 3 nodes in half an hour. To take the juice out the game, this is the way to do it ! Got about 5 nodes in a full lap around Borean Tundra. At this rate legacy armor pieces are going to have to cost 50k each because ore is so sparse. I suppose they reduced the spawns at some point but seem to have gone a bit too far. ► My miner is a Horde druid for faster in-and-out flight. ► Each zone was timed for 30 minutes. ► Links will take you to maps on my website. I love the background music in this zone while I'm farming. But one of its flaws (the zone, not the music), are the mountains. You can be flying from one are to the next without any ore in sight. However, that doesn't mean the zone doesn't offer ore in various clusters. While this zone has the ore bunched closer together, I wasn't able to get as much Cobalt as I would've liked. Keep in mind though, due to the simple nature of the zone and how close these nodes are, you're liable to have competition.